When the golden days of autumn arrive, the masses have a habit of flocking to the hills for vistas of leaves aflame with color. Those who detour to Northwest Florida, however, insist that fall is the best time to enjoy the jewels of the Emerald Coast, where laid-back days on the beach are exceptionally pleasant with warm sunshine and low humidity. Indeed, if seeking an idyllic Indian summer retreat, even the most discerning traveler cannot refuse top-tier accommodations nestled within a charming village by the sea. What could possibly make for a better getaway? The Merchants of Seaside in the New Urbanist community of Seaside, Florida, on Scenic Highway 30-A contemplated that question and artfully decided to add a splash of red—along with a dash of white and a little sparkle—to create what is now one of the region’s most anticipated events of the year. Celebrating its twenty-third anniversary in 2013, the Seeing Red Wine Festival, taking place from Thursday, October 31 to Sunday, November 3, compels connoisseurs and the curious alike to make their reservations well in advance for glorious tastings of wine and food, fabulous entertainment, exclusive retail buys, and enlightening encounters with wine and culinary experts. “The Seeing Red Wine Festival continues to be popular because wine aficionados and those simply with an interest in learning more can enjoy a long, relaxing weekend during one of the most beautiful seasons in Northwest Florida,” says Lori Leath Smith, director of public relations and marketing for Seaside Community Development Corp. The festival is, of course, about seeing red and features more than two hundred fifty red wines. Nonetheless, the celebration embraces all vino varieties from around the world and invites winemakers to submit their entries to thirty different categories for judging. 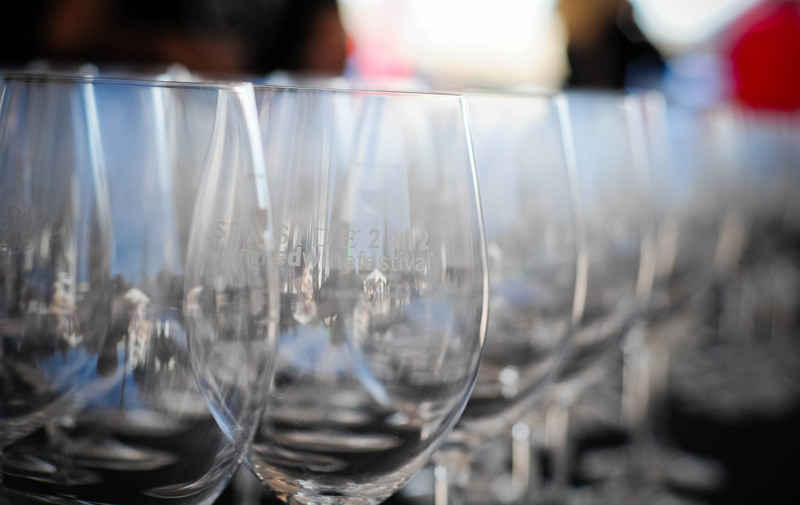 Sixteen local wine experts, divided into four separate panels, use their knowledge and keen senses to award gold, silver, and bronze medals in each category, along with Best of Show – Red and Best of Show – White. The à la carte menu of events officially kicks off on Thursday evening with the festival’s annual Fall Wine Dinner at Bud and Alley’s Restaurant, a longtime Seaside favorite. This year’s dinner spotlights guest vintner Jed Steele of Northern California’s Steele Wines. After sunset, Friday evening unfolds with the Al Fresco Reserve Wine Tasting at Seaside’s Ruskin Place Park, an elegant affair granting visitors exclusive access to rare wines paired with renowned Chef Jim Shirley’s delectable hors d’oeuvres. Shirley, chef and owner of the Great Southern Café in Seaside, has made extensive contributions to the culinary world, including founding the Society of Great Southern Chefs and serving as a food columnist for the Pensacola News Journal. The Pensacola native also authored the book Good Grits! Southern Boy Cooks. The Crush wine seminar offers an educational component to the festival this year; hopes are that it will become a popular addition and a mainstay for years to come. While indulging their taste buds at Ruskin Place Park, epicureans can also satisfy their thirst for knowledge about terroir (the soil and climate conditions in which grapes are grown), viticulture (the cultivation of grapes), varietal composition, and food pairings. The Sean Dietrich Trio will set the tone for the event with original jazz compositions. Another option for Friday evening is the Taste of The Beach After Dark, also presented by Crush Wine Bar. This intimate four-course dinner pairs the chef’s signature delicacies with the same wines highlighted earlier during the wine seminar. The celebration of wine and food resumes on Saturday with the Seeing Red Wine Festival Grand Tasting, popularly described as “the perfect afternoon.” Stationed along the streets of Seaside, wine aficionados pouring hundreds of red, white, and sparkling varieties will entice and educate festivalgoers. Paired with just the right edibles and live music, each vintage wine can be savored as intended. Roman Street, the headlining band to perform on the Seaside amphitheater stage, is one of the entertainment acts chosen to echo the festival’s spirit. Born and raised in nearby Mobile, Alabama, the group’s members describe their music as “new flamenco, smooth and not-so-smooth jazz,” coupled with their own interpretation of fusion style. With four live entertainment areas stationed throughout the festival, all can enjoy the celebration. Rather than hosting one central culinary pavilion, organizers invited Seaside restaurants—plus a hand-selected few from nearby communities—to participate in the Grand Tasting. Bud and Alley’s Restaurant will also host notable local chefs on the Savor South Walton Culinary Demo Stage in the restaurant’s herb garden throughout the afternoon. During the Grand Tasting, a retail wine tent will provide an impressive selection of bottles, which festivalgoers and the public may purchase. T-shirts and art prints will also be available for sale throughout the Grand Tasting, and commemorative wine glasses are included in the ticket price. This year’s grand finale, the Celebration of Bubbles, is on Sunday. The joyful brunch at Great Southern Café introduces unforgettable pairings of sparkling wines from around the world and locally harvested foods prepared with a Southern flair. By the time the twenty-third Seeing Red Wine Festival concludes, all attendees will likely feel supremely satisfied. Besides returning home with choice wines, fascinating perspectives, and wonderful memories, individuals can also leave knowing that their participation has helped others in need. As a collaborative effort by the Walton Area Chamber of Commerce and Destin Charity Wine Auction Foundation (DCWAF), the festival has a charitable component—Taste of The Beach—where prized vintners and renowned chefs contribute their talents for nonprofit fund-raising. The majority of proceeds from ticket sales will benefit local organizations that work to improve the physical, emotional, and educational lives of underprivileged and at-risk children in Northwest Florida. Over the years, the festival has been continually successful, bringing in record numbers of folks to stay in Seaside and raising more than $125,000 for local charities. Readers can learn more about the particular charities served and purchase tickets to the Seeing Red Grand Tasting at www.tasteofthebeachfl.com/events. Details about free parking, shuttle buses to Seaside, and reservation information for other events are available from the festival’s website at www.seeingredwinefestival.com. Seaside accommodations, ranging from intimate bed-and-breakfast rooms to family cottages, are offered with complimentary amenities (swimming pools, tennis courts, fitness centers, and more), and some include free wine festival tickets. For personal assistance with reservations, please call 866-976-7990.